The Grand Prix continues in Kingston, Ontario, with four time Grand Prix medalist Alissa Czisny and 2009 Trophee Eric Bompard bronze medalist Adam Rippon headlining Skate Canada, Oct. 29-31, for the United States. Czisny and Rippon will be joined on Team USA by Marissa Castelli and Simon Shnapir, Madison Chock and Greg Zuerlein, Alexe Gilles, Grant Hochstein, Britney Simpson and Nathan Miller, Rachel Tibbetts and Collin Brubaker and Agnes Zawadzki. Skate Canada was set to include two-time U.S. Champions Keauna McLaughlin and Rockne Brubaker and three-time U.S. Champion Johnny Weir but all three withdrew earlier this summer. McLaughlin and Brubaker are no longer skating together, with Brubaker recently forming a new partnership with Mary Beth Marley. Weir, the reigning Grand Prix Final bronze medalist, has taken time off from competitive skating this season to pursue other interests, making way for Hochstein to make his career Grand Prix debut. Skate Canada also marks the circuit debuts for Simpson and Miller, Tibbetts and Brubaker and Zawadzki. The event was also set to include Canada’s Tessa Virtue and Scott Moir, the Olympic gold medalists and World Champions, but the ice dancers withdrew because of an injury to Virtue’s leg, which recently required surgery. Canadian Pair Champions Jessica Dube and Bryce Davison, the 2008 World Championship bronze medalists, have also withdrawn because Davison injured his knee. In the ladies competition, Czisny looks to continue a streak of impressive performances at Canada’s Grand Prix. She is the 2009 Skate Canada silver medalist, 2008 bronze medalist, 2006 fourth place finisher and 2005 gold medalist. Her only other Grand Prix medal came at 2005 Skate America, where she was second. Czisny was fourth at Rostelecom Cup (Cup of Russia) the two previous seasons. Czisny, who finished 10th at the 2010 U.S. Championships but won the national title in 2009, is making her competitive debut under coach Yuka Sato and Jason Dungjen. She will also debut two new programs, “Romance” from Violin Concerto in D by Erich Wolfgang Korngold for the short program and selections from “Winter into Spring” by George Winston for the free. With new coaches and programs, Czisny hopes to revitalize her career from the disappointment of not making the 2010 Olympic Team. Two rising stars from Colorado Springs, Colo., look to provide a challenge to Czisny as they both vie for their first Grand Prix medal. Gilles made her Grand Prix debut last season, placing fifth at Trophee Eric Bompard before finishing 10th at Skate America. 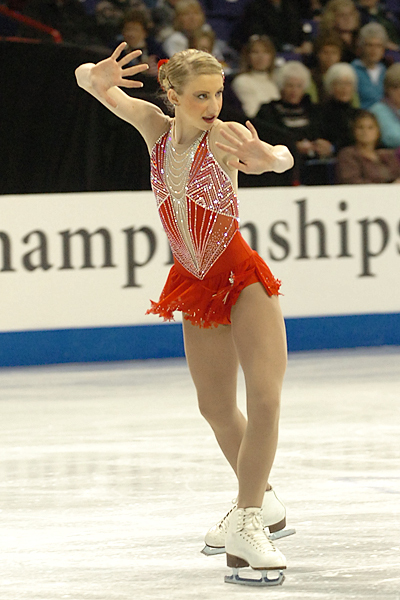 She placed eighth at the 2010 U.S. Championships, one spot higher than the previous season, and ninth at Four Continents. Gilles returns to her short program from last season, Cinderella (excerpts from “Aschenbrodel”) by Johann Strauss II performed by the National Philharmonic Orchestra. She will debut a new free skate to “Adagio” from the Queen Symphony by Tolga Kashif and “Nocturne/Bohemian Rhapsody” by Paul Schwartz/Freddy Mercury. Gilles, the 2008 U.S. Junior Ladies Champion, trains under Tom Zakrajsek and Becky Calvin with 2010 U.S. Junior Ladies Champion Zawadzki. While Zawadzki is new to the senior ranks, making her debut in Kingston, many have pinned her as the dark horse. She’s relatively unproven in international events, only having competed at World Juniors previously, where she won the silver medal, but she has crowd appealing pizazz along with solid triple jumps. For her short program, Zawadzki is skating to “Gopher Mambo” while her free skate is set to “Ziegeunerweisen” and “Hungarian Rhapsody”, both choreographed by Lori Nichol. At the recent Southwestern Regional Championships, both programs were well received, so much in fact that her 60.48 points in the short program would have given her a three point lead at last week’s NHK Trophy in Nagoya, Japan. Three-time Canadian silver medalist Cynthia Phaneuf, the 2004 national champion and Skate Canada Champion, will also compete in Kingston. With the absence of Olympic bronze medalist of Joannie Rochette, who elected not to compete on the Grand Prix this year, Phaneuf is looking to become Canada’s leading lady. She finished 12th at the Olympic Winter Games and fifth at the World Championships last season, missing out on the bronze medal by a little over a point. She was sixth and seventh at 2009 NHK Trophy and Skate Canada respectively. While the North American ladies are strong, they face competition from Switzerland’s Sarah Meier, Japan’s Fumie Suguri and Russia’s Ksenia Makarova, all who could medal in Kingston. Meier, who won 2006 Cup of Russia, placed third at the 2006 Grand Prix Final and finished second at 2007 NHK Trophy, has experienced injuries in recent seasons. She missed most of 2008-09 because of a herniated disc. In 2009, an achilles tendon inflammation forced her out of the Grand Prix, although she returned in the winter for a fifth place showing at the 2010 European Championships, 15th place finish at the Olympic Winter Games and a dismal 26th placement at the World Championships. At age 29, Japan’s Fumie Suguri has experience on her side, having competed internationally since the 1994 Gardena Spring Trophy and on the Grand Prix since 1996. She is a 13 time Grand Prix medalist, last winning the gold at the 2003 Grand Prix Final, and a three-time World Championship medalist (silver in 2006 and bronze in 2002 and 2003). She finished fourth at the 2006 Olympics but after finishing seventh at 2009 Cup of China, fourth at Skate America and seventh at the national championships, she failed to make the cut for Vancouver. The last woman to win Skate Canada in her debut was Canada’s Josée Chouinard in 1990. Makarova, who has been mentored by Weir, hopes to change that. She is making her debut on the Grand Prix circuit following two medal winning performances on the 2009 Junior Grand Prix circuit. Earlier this year, she finished ninth at the European Championships, 10th at the Olympics and eighth at the Worlds, proving to be a legitimate contender for the gold in Kingston. In the men’s competition, three-time Canadian Champion and two-time World silver medal Patrick Chan returns to Skate Canada following a dismal performance in 2009, where he finished sixth only weeks after withdrawing from Rostelecom Cup because gastrocnemius tear in his left calf. Chan finished fifth at the Olympics, making him the highest placing skater from Vancouver to compete in Kingston. Chan may be the favorite but Rippon, who trains in Toronto, hopes to take home his first Grand Prix gold medal. They will be challenged by France’s Alban Preaubert and Japan’s Nobunari Oda. Preaubert won silver at 2006 Trophee Eric Bompard and bronze at 2006 Skate America, 2007 Trophee Eric Bompard, 2008 Trophee Eric Bompard, 2008 Cup of Russia and 2009 Skate Canada. Oda started out strong last season with gold medals at Cup of China and Trophee Eric Bompard and then a silver at the Grand Prix Final behind eventual 2010 Olympic Champion Evan Lysacek. But at the Olympics, Oda finishing seventh following boot trouble in the free skate. He imploded in the short program at the Worlds, performing only single jumps, and failed to make the free skating portion of the competition. Oda left his coach Nikolai Morozov in the spring, returning to former coach Lee Barkell. Rippon comes into Kingston with the momentum of a gold medal performance at 2010 Four Continents and a sixth place debut at the 2010 World Championship. Earlier this season, he also competed for Team North America at the Japan Open, and easily topped the field, which included three Olympic medalists. He finished the free skate (no short program was held) with 166.63 points while World Champion and reigning Olympic bronze medalist Daisuke Takahashi, who just won the NHK Trophy, placed second with 159.19 and 2006 Olympic Champion and reigning silver medalist Evgeni Plushenko of Russia placed third with 151.00. Rippon has steadily moved up the rankings since making his senior debut in 2008, where he finished eighth at Skate America and fifth at Cup of Russia, and has especially thrived since switching to coach Brian Orser just a few weeks before the 2009 U.S. Championship. He won the bronze medal at 2009 Trophee Eric Bompard and placed sixth at the NHK Trophy. He was seventh at the 2009 U.S. Championship but improved to fifth last season. He has two new programs for the season. The short program is to “Romeo andJuliet” by Tchaikovsky and the free skate is to “Free Piano Concerto No. 2” by Rachmaninov. Both are choreographed by David Wilson, who works with Rippon in Toronto. Hochstein has already had impressive performances this year, making his senior debut with a seventh place showing at the 2010 nationals. He was fifth at the 2010 World Junior Championships and just recently placed fourth at Finlandia Trophy, his opening event of the season. Hochstein competed on the 2009 Junior Grand Prix circuit, placing second in Hungary,fourth in Germany and fifth at the Final. His short program is set to Jules Massenet’s “Suite No. 3” and “Herodiade” performed by the New Zealand Symphony Orchestra. His free skate is to music from Spartacus by Aram Khachaturian. Hochstein works with choreographer Jodie Tasich. With Dube and Davison out of the pairs competition, there are no clear favorites for the title, although Canadian Meagan Duhamel hopes Skate Canada is her coming out party with Eric Radford. Duhamel, who has twice competed at the World Championships (finishing sixth in 2008 and eighth the next year) teamed up with Radford earlier this year after her previous partner Craig Buntin retired following their bronze medal at 2010 Four Continents. Duhamel and Radford placed third at Nebelhorn Trophy. Of the pairs in Kingston, China’s Dong Huibo and Wu Yiming are the highest standing pair International Skating Union (ISU) World rankings. They placed third at the national champions last season then took eighth at Four Continents and 17th at Worlds. They have never medaled on the Grand Prix. Their highest placement was fourth at 2008 Trophee Eric Bompard. They were sixth at Trophee Eric Bompard and Cup of China last year. Russia will be represented by 2009 World Junior Champions Lubov Iliushechkina and Nodari Maisuradze and 2009 World Junior silver medalists Anastasia Martiusheva and Alexei Rogonov. Iliushechkina and Maisuradze, the 2009 Golden Spin of Zagreb Champions, have twice competed on the Grand Prix before, finishing fourth at 2008 Cup of Russia and fifth at 2009 Cup of China. They were fourth at the recent Russian national championship while Martiusheva and Rogonov were ninth. Martiusheva and Rogonov were second at 2009 Golden Spin. They placed seventh at the 2009 Rostelecom Cup. Castelli and Shnapir are ranked 22nd in the world rankings, right behind Iliushechkina and Maisuradze. The Americans, who were third at the 2009 World Juniors, made their senior debut last year at Trophee Eric Bompard, finishing seventh. They won the Eastern Sectional Championship, place 10th at the 2010 U.S. Championship and 10th at Four Continents. Castelli and Shnapir come into the season with two new programs, a short program to “Money” by Pink Floyd and “For the Love of Money” by the O’Jays and free skate to selections from the Avatar soundtrack by James Horner, and clear goals. They are working on improving their triple twist as well as their side-by-side triple jumps and would also like to attempt their first throw triple Axel in competition. Simpson and Miller were expecting to make their senior debut at Rostelecom Cup, Nov. 19-21, in Moscow, Russia, but were called on to replace Dube and Davison. On the 2009 Junior Grand Prix circuit, they were fourth at JGP United States, third in Germany and sixth at the Final. They won the silver medal in junior pairs at 2010 nationals, besting their 2009 pewter medal, and placed fifth at the World Junior Championships. Their short program is set to music from The Pink Panther by Henry Mancini while their free skate is to “Moonlight Sonata” by Beethoven. Dalilah Sappenfield, who is their primary coach, worked with choreographer Zuzanna Parchem on the new programs. An innovative brother-and-sister ice dance team known for creative lifts, Sinead Kerr and John Kerr of Great Britain have struggled for recognition internationally but are hoping for their first Grand Prix gold medal in Kingston. Last season, the Kerrs finished second at NHK Trophy, third at Trophee Eric Bompard and fourth at the Grand Prix Final. They also placed fifth at the European Championships, eighth at the Olympics and fifth at the Worlds, their highest ranking in seven World appearances. While the Kerrs have the strongest resume with the absence of Virtue and Moir, they are not heading into Kingston in top condition. Earlier this month, the Kerrs withdrew from Finlandia Trophy because of an injury to Sinead’s shoulder. She was injured on October 5. Canada’s Vanessa Crone and Paul Poirier are also looking for their first gold, having placed second at 2008 Skate Canada, fourth at 2008 Trophee Eric Bompard, fourth at 2009 Cup of Russia, third at 2009 NHK Trophy and sixth at the 2009 Grand Prix Final. They are two-time Canadian silver medalists and placed 14th at the Olympics and seventh at Worlds. Americans Chock and Zuerlein, who were fifth at the 2010 U.S. Championships and Four Continents, had a solid senior debut last season, finishing eighth at Cup of China and improving to sixth at Skate America, but are looking to up the ante. A medal in Kingston would give them their first podium appearance since an impeccable junior campaign in 2008-09, in which they won ever event entered including the Junior Grand Prix Final and the World Junior Championships. Tibbetts and Brubaker are making their Grand Prix debut at Skate Canada. In 2009, they finished seventh at Junior Grand Prix United States but won the silver medal later in Belarus. They placed second in junior dance at the 2010 U.S. Championships and seventh at the World Junior Championships. Skate Canada is the second event of the 2010 ISU Grand Prix of Figure Skating circuit. The series, now in its 16th season, consists of six international events in a cumulative, point-scoring format. The top six scoring athletes in each discipline move onto the Grand Prix Final, Dec. 9-12, in Beijing, China, which will be combined with the ISU Junior Grand Prix of Figure Skating Final for the third consecutive season. The six Grand Prix events are NHK Trophy, Oct. 22-24, in Nagoya, Japan; Skate Canada, Oct. 29-31, in Kingston, Ontario; Cup of China, Nov. 5-7, in Beijing, China; Skate Canada, Nov. 11-14, in Portland, Ore.; Rostelecom Cup, Nov. 19-21, in Moscow, Russia; and Trophee Eric Bompard, Nov. 26-28, in Paris, France. The points toward the Grand Prix Final that are awarded for each place are 15 points for first; 13 points for second; 11 points for third; nine points for fourth; seven points for fifth; five points for sixth place; four points for seventh place; and three points for eighth. In pair skating, only the top six receive points. Figure Skaters Online strives to be an accurate source of information related to the sport of figure skating. To report an error, please e-mail the news editor. Include the article date and title in your e-mail.